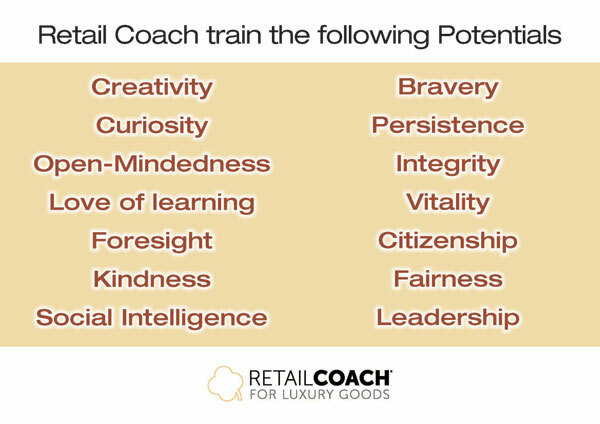 The courses offered by Retail Coach® have been created to increase attendees output and to strengthen the positive leadership qualities of individuals holding position of responsability. START-UP YOUR BUSINESS – 5 day course customized for entrepreneurs willing to launch a new fashion collection, open a store, a showroom or an e-commerce website. This course allows to correctly implement the start-up strategic process to start a new business and teaches how to carefully assess steps and investments needed to achieve the aim, avoiding critical mistakes during the project execution.. POSITIVE LEADERSHIP FOR RETAIL – a 2 day course for Sales managers, Retail Managers , Store managers of large-sized shop, Trade Marketing managers and Brand managers. This course is oriented towards the study of those positive leadership qualities hat each boutique manager and retail manager should possess. It is not limited to simply exemplifying mistakes involving negative behaviour toward staff but provides a “hands on” approach to the use of positive impact making methods that can be used on a daily basis to build a healthy professional relationship with co-workers based on mutal respect. VISUAL MERCHANDISING DELUXE– a 2 day course for Store Managers, In-store visual merchandiser, Sales personnel and Trade Marketing managers. Companies who decide to enrol their resources in this course are aware of a need to change tactics in order to create the figure of a modern, creative, competitive manager with visual merchanising skills. An individual who has been trained to achieve growth objectives with a view to strengthening company strategies in terms of visual merchandising and, above all, brand awareness. The duration of the course is indicative and may vary according to partecipants’ level of preparation. All lessons are taylor-made to suit individual customer requirements.We do not use standard modules because we believe that each business structure and each individuals has unique requirement. While is widely accepted that coaching and training for visual merchandising is an effective approach to increasing the number of customers who come into the retail store, the challenge is how to credibly measure the impact of the coaching and training program on business results. In fact, many may wonder if it’s possible to credibly measure the impact of visual merchandising training and coaching program and report return-on-investment.Indeed, it is possible to measure the impact, and in working with Retail Coach, you will have access to the ROI Methodology™ approach through our partnership with Bloom Coaching Institute founded by Lisa Edwards.